As a technician, some of your accounts will need equipment that is able to grind large amounts of coffee at a time. Perhaps a café sells their beans to customers and needs the ability to grind the coffee for them. Maybe a roaster needs to ship hundreds of pounds of ground coffee a week. It is also possible that your local restaurant needs to grind several pounds of coffee to fill their enormous batch brewer. In all of these cases, you will need a large, specialized coffee grinder. The question is - how do you decide which grinder works best for them? How quickly does the coffee need to be delivered? How much coffee will be ground at a time? Or how much coffee will be ground a day? What will the ground coffee be used for? Espresso? Pour-over? French Press? How often will the grinder be adjusted? In our three example cases, we have differing parameters for expected delivery speed. In a café, customers are willing to wait, but only for so long. In this case, you will need a larger motor to spin larger burrs so that you can grind 16oz of coffee in roughly one minute. This grinder would ideally have burrs 75mm diameter burrs or larger and should hold at least a pound of coffee in the hopper. You may also want to get a grinder with a ‘bag clip’ on the spout to hold the final coffee bag in place. In the example of the roaster, they are really going to need a special piece of equipment. As a new start-up roaster, speed might not be a factor because they just sell a couple pounds here and a few pounds there. But, as they expand and grow their business, grinding coffee will become a major snag in their delivery process. They will have to be able to be efficient. They should have a large, industrial grinder with burrs exceeding 100mm in diameter. If this roaster plans to wholesale coffee in their local area or beyond, they will need a hopper that can hold 3-5 pounds, depending on the size of bag they want to sell. For the local restaurant, they may get a rush or two, but should have a batch of coffee brewed just ahead of the order so that the grind speed doesn’t really impact the speed of service. Instead, this customer will need a reliable work horse to grind large quantities of coffee at a time. Any grinder rated to grind the necessary amount of coffee in one go will suffice. Now, you may be able to run a Mazzer Mini for a minute or two on a course grind and produce enough coffee to fill the brewer. That does not mean that the Mazzer Mini is an okay recommendation. 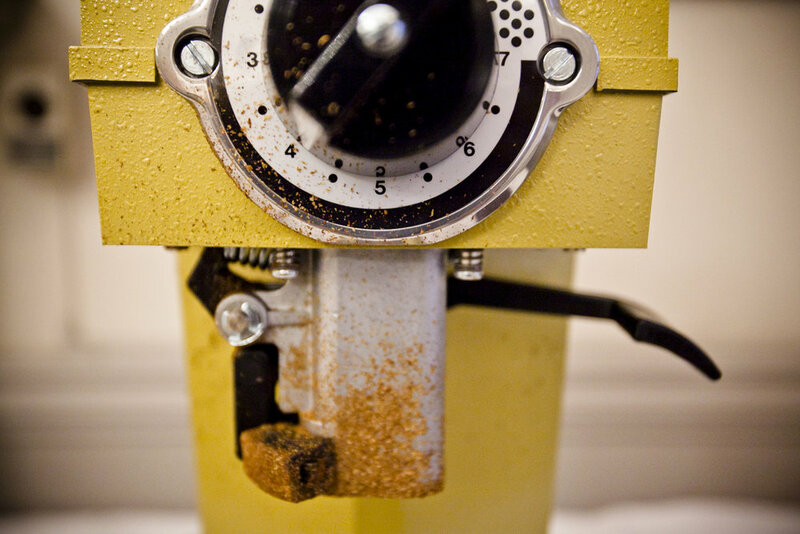 The grinder is only engineered to grind an espresso-sized serving of coffee followed by a reasonable rest. Using such a grinder for bulk batches will prematurely wear the burrs, motor and other critical components. The usual café will grind a pound at a time with a decent break between ground coffee sales. However, you need to consider each case on its own merit. It is possible that a café sells ten pounds of coffee per day, but all of those sales happen as people stop in from 7:30am to 9am. That means that a pound of coffee is ground every nine minutes. This is a fair strain for a grinder and will require a larger piece of equipment to keep up, even though it will sit idle for more than three-quarters of the day. This café may need a similar grinder to a small, start-up roaster. Roasters are either going to roast all of their coffee and then grind and bag it immediately, or they are going to bag it and grind it later as they need it. This is an important difference because, if they have a 20 pound roaster and need to grind half of it for the day, every batch will either require the grinder to run for ten pounds back-to-back, or, maybe they will grind the coffee only as it is ordered allowing the grinder to grind a pound or two before it is able to rest and cool down. If the roaster plans to grind the coffee all at once, they could need two or even three grinders to keep up with the load. If the roaster will spread out the load, they may be able to use just one large grinder. A restaurant will typically use their grinder and let it sit before they have to use it again thus broadening the range of acceptable grinders at their disposal. However, a breakfast spot that can hardly keep enough coffee in the cistern may prove to be an exception. They might grind coffee back to back to back as they run their one or two coffee brewers but only have counter space for one grinder. In such a case, they will need a large bulk-grinder to keep up with their morning rush. There are two types of burrs used in bulk grinders. They look very different from one another. One is really an extra-large espresso grinder burr. It has a similar tooth pattern but a much larger surface area. This type of burr is capable of achieving a Turkish grind. The second type of burr has a much more aggressive tooth pattern. It will have a primary cut that is cut from the center of the burr straight out to the edge (though it doesn’t reach that far). This type of burr is made for speed and heat efficiency but really won’t adjust fine enough to reach a Turkish grind. These burrs have been specially designed for high volumes with different goals in mind. In the café, if they find that their customers need to grind for espresso, then they will need to purchase a grinder with the first type of burrs. These grinders could be a Ditting or a Mahlkonig or a Mazzer, Eureka or similar grinder. The key is to get one that is large enough to handle the load the café will experience. If the café doesn’t serve espresso and doesn’t think their customers will demand Turkish grinds, they may be able to use the second type of burr. In such a case, they may want to look at a Curtis, Bunn, Grindmaster or similar unit. For the roaster, they are probably going to need the ability to grind coffee for espresso. That will require them to use the first type of burr in at least one of their grinders. If they are packaging coffee to be used in brewers then they may also need the second type of burr. The restaurant may or may not have an espresso machine. If they don’t they are going to do well with the second type of grinder. However, if they do have an espresso machine and need the grinder to be able to grind both their espresso and their batch coffee then they will need the first type of burr, or, they will just need two grinders - one bulk grinder for the brewer and one espresso grinder for their espresso machine. Some grinders are easier to adjust than others, and some grinders allow for a greater precision in adjustment than others, knowing the customer’s desires will help guide your recommendation. Many of the grinders with burr type one will allow for micro-adjustments to dial in your espresso. Most grinders intended to grind in bulk will have an adjustment dial that makes it possible to swing from one grind to another and back quickly and easily. These will have different brew methods marked out enabling you to grind for French press one batch and then grind for pour-over the second batch with a simple 180 degree turn of a knob. Others will have a collar on the top for adjustment, these are not as fast swinging back and forth between grind sizes, but will allow you to make a smaller adjustment to your grind to perfect the job. These, normally, have the first type of burr. The café will be likely to adjust their grind frequently and so will need to have the ability to grind to their customer’s needs. This means that a front-knob adjustment is helpful. The roaster is unlikely to know how their customer will brew the coffee and so may not adjust the grind that often. Or, they may label bags of coffee according to the brew method the coffee is ground for and may actually need to adjust. The restaurant is unlikely to change brew method very often and so will be able to almost lock in a grind setting and not move it often. The café might need the capability to grind for espresso and might need to grind during a rush making the usage close together. The café may require that they can grind 16 oz at a time. This type of customer might want to aim for something like a Ditting KR804, for example. It may be overkill for some of the day, but it will perform when they need it most. Other cafés may get away with a Super Jolly, it all depends on need. Many cafés will also run a brewer and so may want a burr type two grinder as well to fill their need. This discussion merely focused on their need to grind coffee as customers order bags to go. Roasters may start out with a grinder similar to the one we recommended to the café, but are likely to out-grow such a grinder. If they are willing to spend a little more money up front, they may save themselves a costly upgrade later. A Roaster will need to grind espresso, will grind in bulk for long periods and needs to be able to fit five pounds of coffee in the hopper (in some cases). This type of customer may want to start out with something equivalent to a Ditting KR1204. These types of grinders are work horses and can run for hours. If the roaster outgrows the grinder, it isn’t a bad idea to simply add in a second similar grinder and run them both. This allows for a distribution of heat across two sets of burrs and two housings rather than forcing an upgrade to a very costly model like the KF1800. The two-grinder model also provides redundancy in case of failure on one grinder. Restaurants with or without espresso machines are going to grind one batch at a time most of the day but need to have enough capacity to keep up with any surges they see in customer demand. They will likely want a grinder similar to the Wilbur Curtis SLG10. It should meet demand and allows them to grind directly into the brew cone eliminating the need for an intermediary container. They could also have a Super-Jolly size grinder or larger to manage any espresso needs they may have. Please note that all specific grinders and grinder brands referenced in this article are chosen due to the author’s familiarity. There are sure to be there fantastic options out there, the reference is intended to allow for an accurate comparison.